There’s a creek that runs through my neighborhood. I walk it frequently. I consider myself the unofficial keeper of this creek, as I uproot invasive mustard plants and pick up dozens of bags of trash along a mile stretch of the creek. Yesterday evening, my son and I were walking our dog along the creek. 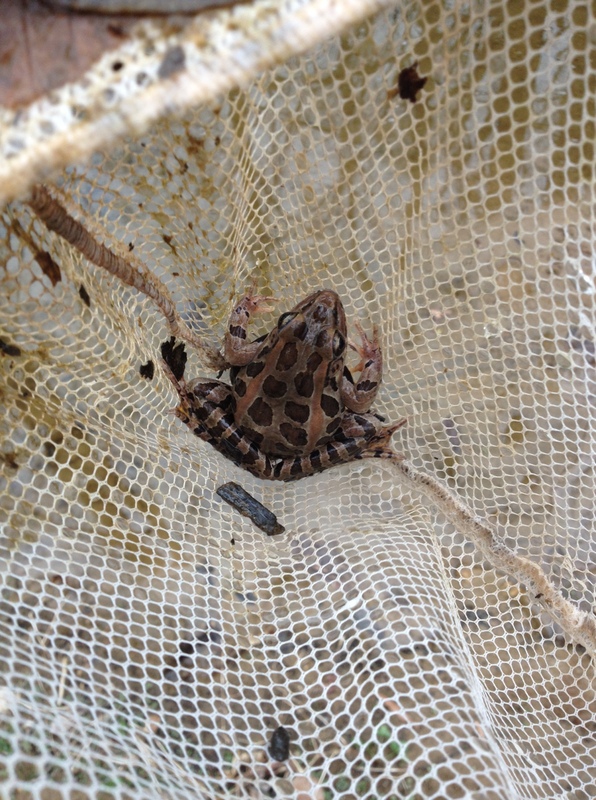 My son caught a frog in his net. I don’t know if they’re a native species, but there are patches of these stunning flowers all along the creek. I recently saw a large fish that swam and looked like a trout (I’ve seen trout in rivers in CO). A couple of days later, I saw a similar fish dead in the water. 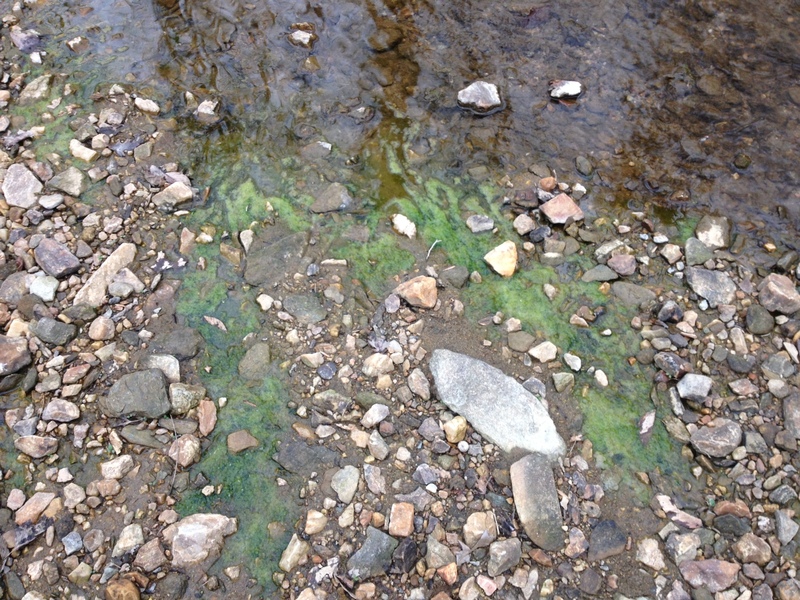 On our walk last night, I came across some algae blooms. Algae is caused by excess nitrogen from lawn fertilizers and chokes the oxygen out of our waterways, making it difficult for other marine life to thrive. If you happen to fly into National Airport, take a look down at the Potomac River and you’ll see vast swaths of algae blooms. As I walk in my neighborhood and drive through others, I am astounded at how many people put chemicals on their lawns, chemicals that are killing our creeks and rivers and hurting the Chesapeake. I thought its message was one that would reach the mainstream and at least get people to skip adding chemicals in the spring – and bring attention to the fact that lawn chemicals do indeed hurt the Bay. My friend, Matt Logan, is president of a group called Potomac Riverkeeper. I suggested to him early this week that we team up to do something about the lawncare chemical industry’s saturation of chemicals on lawns. I was pleasantly surprised when he sent me an article showing that a law in MD was passed in 2009 that somewhat limits the application of lawn chemicals (the legislation generally copied Annapolis’ existing law). Regulating the supply is a good start. The next step is to decrease demand by educating consumers and changing their behaviors. Please join this campaign to save the Chesapeake watershed – and take comfort in knowing that there are many on board already. This entry was posted in bugs/animals, environment, home, Lawn, Living, nature, water and tagged algae, creeks, fertilizer, lawn, lawn chemicals. Bookmark the permalink. I’m with you 100%. Along with growing food for humans in your yard, please grow some plants for your local pollinators (like bees, butterflies and hummingbirds). Caterpillars gotta eat to grow into butterflies. Find out what plants different species of butterflies need by searching for “butterfly host plants”. Bet your son would love to watch Monarch caterpillars grow. And…. 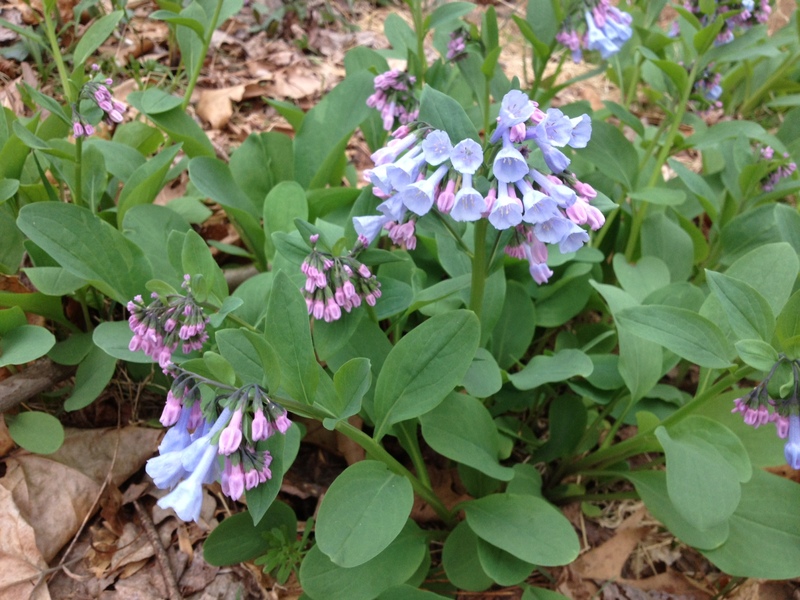 yes, the flowers are natives- Virginia Bluebells or Mertensia virginica. The lawn care industry has managed to create the insane desire among people for lush, green, monocrop grass yards. Totally unnatural!!!! A mowed lawn is a biological wasteland. Local governments support this idiocy by passing “weed control” laws. There’s a much better way to be environmentally friendly by growing native plants and eliminating golf-course like lawns. I agree. Don’t know when this started, having to kill everything with chemicals to have the “perfect” lawn. We are destroying what nature has given us. Yes, but how do we do it? Who can guide us? What about HOA’s–are they legally able to enforce their lawn standards, or is it just bluffing? Those are really good questions. How do you replace turf grass with native plants? The task can be difficult even for experienced gardeners In nature, plants grow in communities that share the same conditions of soil, light, moisture and temperature. For help with your specific plant needs you can contact a native plant nursery and I highly recommend the Maryland Native Plant Society. The Montgomery county chapter has monthly meetings at Kensington library and members include professional botanists and horticulturalists. Their website is http://www.mdflora.org and has lots of helpful links. About HOAs- I’m still trying to figure that one out. Most of my neighbors think I’m a little odd… or hate me for letting the violets grow in my yard. (Violets are food plants for gorgeous Fritillary butterfly caterpillars.) I’m trying to introduce people to native plant/wildlife garden concepts but I haven’t found much interest. I suggest calling your representatives, joining groups like Potomac Riverkeeper and The Alice Ferguson Foundation- and pushing them to take action. And, trying to influence HOAs is a great idea. When I was a kid, my mom protested having her house sprayed for gypsy moths and wouldn’t let the state do it. The neighbors were upset, so mom left flyers in their mailboxes that explained the potential harms of spraying. She convinced some neighbors to not spray. I will discuss this issue with our leadership team to see how we at MOMs can roll out an education campaign to our customers. Most of MOMs customers are already lawn pesticide savvy. How can MOMs also reach out into the community? Bethesda Green would be happy to partner with MOMs on an educational campaign about safe lawncare maintenance. We currently have a monthly neighborhood association gathering where we set up green teams and disseminate information useful to homeowners. We also blog info to our readers though its a bit of preaching to the choir. Our partner green groups in Wheaton, Silver Spring, Poolesville and Gaithersburg, I’m sure would jump on board. I have a tiny back yard behind my townhouse but did plant “butterfly” plants and love them. Sadly the poor bees don’t seem to be at the population they once were and that circles us back to the over use of all chemicals on flowering plants, but this still includes the excessive need to feed grass (didn’t grass do just fine for millions of years without all those chemicals) only to have to then cut it down every week – which is a whole other topic in air pollution. I have never put any fertilizer or weed killer on my yard and it is doing must fine. Round-up should be illegal. Once we get past the mind set that our yards must look like golf courses we will all be much better. Sorry to hear about the decline of your local bees. Mine are becoming scarce too. Lots of people don’t know that many native bees, unlike European honey bees, don’t live in hives or even in a social group. Many native bees are solitary and nest underground. Our need to cover every piece of earth with concrete pavers, thick turf grass and heavy layers of mulch is making habitat for our bees scarce. When these rare patches of bare earth are inundated by rain water washing off lawns and roads, the bees get a big dose of chemicals, too. Native bees are excellent pollinators. Some studies find them better than honey bees for this purpose. Without pollinators, we would not be able to enjoy many fruits and vegetables, such as apples and cucumbers. By the way, the turf grass that we grow on our lawns is not native to North America. We’re acting in such a short-sighted way. Will we get this under control fast enough? I don’t know but I sure hope so, otherwise we’re in for worse. Algae blooms like the one that covers Lake Erie each year will be the norm all over the world, antibiotic resistance is occurring in sea animals from factory farms & unsustainable practices. We’ve had concepts marketed to us and for years accepted it. We want green lawns, well here’s a product that can make the grass really green. It was a consumer demand and it was met in an era when there was general cluelessness about the consequences dumping newly created chemical compounds into our environment. When consumers wake up and begin to question whether having green grass at any cost is worth it, if it is a wise idea to use toxic chemicals on their kitchen countertop so that it will shine, etc. then the products will go away because consumers won’t purchase them any more. My little one came home yesterday and told me the house next the school field was having pesticide application applied while the school kids were out playing. She could smell the vapors at the playground. We are a sick society when we sell out the health of our kids just to kill a few weeds! Those yellow pesticide signs are everywhere in our community, people must think they spring up with the spring daffoils. Why do we hate weeds more than we love our families? Scott, How wonderful that you spotted native bluebells, and birds and other wildlife on your walk with your son. For more than a decade, I have studiously avoided the use of chemicals in my garden. The result: I have a flourishing colony of bees visit every year, along with hummingbirds, Carolina Wrens, Robins, Black-Capped Chickadees, Downy Woodpeckers, squirrels, raccoons, an occasional frog, and several species of butterflies, including the gorgeous Monarchs. The vegetables and strawberries that I grow in my garden taste far better than anything from a store, and I have no lawn. I got rid of all the grass and am adding as many species of native plants and trees as I possibly can. You can start the effort to preserve the environment by stopping to sell bottled water, and instead sell water filters and water filters. And perhaps you could also hold workshops on organic gardening. Good luck. I am so lucky to have a MOM’s in my neighborhood. But I don’t know what will happen when the shopping center in Arlandria is torn down. Do you have an alternative location for your Alexandria store? Hi Vineeta. Your garden sounds wonderful. Not sure if you realize this, but MOM’s stopped selling bottled water a few years ago. Also, when the shopping center in Arlandria is torn down, we will go into the new center that will replace it. It will be torn down and built in 2 phases so that we will be able to stay open while they build our new store (over where the CVS used to be). I’m pretty sure that we won’t even need to be closed for a single day between closing and opening. I have visited the new MOM’s in Merrifield. If the new one in Del Ray is anything like it, it will be a very exciting addition to the area. Hi Scott, I thought I saw the big bottles of water at the store recently–like the kind that go into the water coolers at work–but maybe I’m mistaken. It’s wonderful that you’ve stopped selling the smaller bottles. The Brita pitchers work well for me–I have one at work and one at home. I’m delighted to hear that the shopping center in Arlandria will be torn down in two phases so you won’t need to close at all. That’s really wonderful news. I think it’s not an exaggeration to say that MOM’s helped spark the gentrification of that shopping center. Will the new one have a cafe to eat in? My friends and I are planning to meet for lunch at the lovely new MOM’s in Merrifield one of these days. Thanks for all that you do. Could I also ask that you consider buying fewer food items from China? For example, the pine nuts and goji berries. I really do worry about food from China. Thanks again. The new MOM’s in Alexandria will be almost identical to the one in Merrifield, including the Naked Lunch. Vineeta- we do not sell 5 gallon water bottles. Regarding foods from China- coincidentally, there is a debate going on this week at MOM’s about controlling commodities from China. It’s complicated- we buy bulk products from wholesalers but we never know their origin until we receive them. There are very few items at any given time (I believe less than 5), but we still wish there was some consistency of origin. OTOH- we want to support legitimate organic farmers no matter where they farm, so if the product is certified by a legitimate 3rd party American inspector (which all of our products are), then we’re good with the product. That “gentrification” as per Vineeta will sadly be the byproduct of redevelopment in Del Ray. I am sure it is not the reason-to-be for a MOM’s in any area, and I am not sure the moderate/lower income residents are MOM’s market, but just remember that “gentrification” will ultimately mean an entire culture of that area will change. Nothing like a sterile lilly-white gentrified neighborhood. It is the beginning of the end of Del Ray as we know it. A friend of mine has joked that the 24-EXPRESS market will eventually be converted to a 24-EXPRESSO cafe. Times are a-changen’ in Del Ray, but it does not mean we can’t call it out for what it is. Poverty is the problem, not gentrification. Nice areas encroaching on poor areas is a symptom of poverty (that poor areas even exist)- but not a problem, in my opinion. When areas improve, the demand for housing goes up, and values increase. It is natural to want to improve. It is unfortunate, however, that not everyone can participate in the benefits of an improved area, but that doesn’t mean that we should stop improving. The flower in the photo is Virginia Bluebell and I believe it is native. My condo association is attempting to transition to native plantings including pollinator gardens. The obsession with pristine lawns is going to be a big problem. Clover is not the enemy!!!! Clover flowers attract bees. That is a good thing! Fixes nitrogen in soil. That is a good thing!! We are in the process of finding a landscape designer who specializes in native plantings and more benign ways to sustain an environment. It is a big piece of property. Lots of challenges. Last I knew, Scotts was introducing genetically modified grass seed. OH NOOOOO! Something worse than lawn…. GMO lawn. YEAH! Great news! MOM’s is selling plants native to the Mid-Atlantic region. Way to go Scott! I am a former Fairfax County Master Gardener. One of the most maddening questions I was asked over and over and over was “What can I spray?”. Some plants were beyond redemption and people still wanted to spray it to make it better. And the smartest people simple cannot connect the dots between their individual action and its consequence. “It’s not me; it’s them” mentality has got to end. For a number of years I actually knocked on doors of folks whose lawns had good stands of clover! They didn’t think I was totally balmy when I told them about some of the effects of chemicals on children (born and unborn). Even if they had just “not gotten to it” (eliminating the clover) they were glad to have a reason to tell the “HOA-police”. Re HOAs. I will look up some references for this….they are out there. When I was a kid in N.J. every lawn had clover! People did not do much fertilizing in my neighborhood. One neighbor had a picture perfect lawn. Chemicals, I am sure. We all thought he was a sorcerer. And every summer the clover flowered and all four of us kids were stung at least once each by the bees alighting on the clover. More clover flowers; more bees. I could not convince my grounds committee that clover was a good guy. We all went to lecture to hear a Virginia Tech professor talk about lawn care. I purposely asked a clover question to coax out the answer I knew he would give. Now my grounds committee thinks that clover is good! Before planting the organic garden, learn about planting directly into the earth without roto tilling or plowing. Earth that is turned and exposed to UV rays is damaged and half dead, Minerals, vitamins, nutrients degrade exposed to days of high UV sunlight. as well as the killing the earthworms.. Plastic or ground covers to prevent weeds kill the earthworms also. 30 years ago, a Japanese study proved the yields of wild vegetable gardens, weeds and all allowed, was as plentiful as a highly maintained garden. Back then we tested this and it was true. Plenty of veggies and flowers for all, people, birds, animals,and no tedious work. This was a garden of about 3/4 of an acre, Late planters may need to bush hog or mow to allow for sunlight at first but the seed is inserted directly into the earth and all grew plentifully, Now with Lyme, wear pants tucked into socks, All white clothes if possible,,hair in a cap and check carefully afterwards and shower.A poppy seed size fleck of “dirt” may be a nymph tick,so this may not be the best gardening method for children but for what it is worth…it really does work. Very much reduced drought damage.Gourds, pumpkins, squash, sunflowers, zuchinni, brussels sprouts, everything abounds! Most taller veggies in the center,smaller ones towards the edges.Or design your own. Consider sun direction and height of plants, shade created etc.and plant accordingly. Herbs and deterrent co planting help as usual. Try an experimental garden plot now and learn from there each season. As you age and your back needs more rest, you will still have plenty of food! Start early, this cool damp May is perfect! PS… We planted prior to several days of predicted rain, rarely carried water during the “establishment stage” as first aid, prayed good vibes for our garden, while in it and away from it, watered maybe once in July with hoses,and buckets here and there in a limited way not to dry the well, but then never watered again the entire summer which ended in drought but our “weed patch” protected and hid the vegetables under cover and watered by dew and trapped moisture! We had given up hope after the drought, but when we went in for final harvest we could not carry out or use all the food that was there. My goodness! Your user name ought to be “Expert Gardener”! I love how you think and plan. I put in flowers every spring and I too watch the weather and wait for a rainy period and plant just beforehand. I love the idea of leaving weeds in to provide shade and keep water in the soil. Mothers who receive those small rose bushes in pots for Mother’s Day, plant them the following week or asap in sun from morning to midday, but partially under a low branching tree or side of house for afternoon shade, Water often and then do not prune for 3 to 4 years,and let the roots grow deep! Never prune hard like regular roses. No need to dust or spray.They will really take off eventually need a trellis and your gift will bring you such joy for years and years to come! I’m thinking about starting a garden. These are great things to hear from a veteran gardener. Thanks for sharing! btw- We at MOM’s had a meeting yesterday with Potomac Riverkeepers. We have entered a partnership with them to financially support and promote them. While they protect our watershed in many ways, we are going to focus on a campaign to reduce the application of chemicals on land- whether that be suburban lawns or conventional farming. Look for that campaign to begin in the next couple of months. I always joked that it would be nice to have little signs that say, “no crabs were injured in the making of this lawn” to display in my yard (you know- for the neighbors walking /driving by wondering why we have so much clover, violets, etc.). Not sure if it would come across as snarky instead of informative, though. We are fortunate to live in a neighborhood with no HOA, but living at the bottom of the hill, I shudder to think of the “icky chemicals” that wash through my yard every time it rains. Older gardener, you are right about tilling. Importantly, tilling also destroys “soil structure” which is how water and air are carried into the earth to feed plants’ roots. Water will often pan on freshly tilled earth instead of being absorbed. A single common chickweed plant can produce hundreds to thousands of viable seeds. Young plants can make seeds in as little as five weeks. Before you know it, your whole garden is covered with a mat of chickweed! My experience is that weeds rob other plants of moisture and nutrients especially our food crops and weeds can carry plant diseases. Even heirloom seeds do not have the resistance of their wild counterparts. We have bred that out of them when we selected them for large, tasty fruits, leaves and roots. Many weeds make seeds that can travel for long distances. Some make light weight seeds which can be blown about on breezes while others make seeds that are sticky or have barbs. Stuck to animal fur, clothing or even cars and the lawn service mowers, these seeds can travel miles and miles. Our natural areas are being invaded by the likes of mile-a-minuet weed and garlic mustard which crowd out native species. Also, if you want to convince your lawn-loving neighbors that front yard gardens are a good thing, don’t let creeping charlie, henbit or chickweed stray into their yard. I advocate weeding by hand. Use a good hand tool that’s right for the job. It’s good exercise! A last thought- many weeds are edible. Dandelion, garlic mustard and common chickweed are great in a salad. DO NOT EAT ANY PLANT THAT YOU ARE NOT 100 PERCENT SURE OF! Scott, looking at all those pink plastic strips in your trash bag above it looks like you ripped out all of some poor schmuck environmental scientist’s wetland delineation or some arborist’s tree survey! Hope they finished up gathering all the data they needed! Those survey strips drive me nuts! They use them so liberally all over what was a pristine forest area. They just sit there and blow in the wind (they could be cut a lot shorter). The ones in the trash bag were either lying on the ground or tied to a stick or shrub. Many of the strips were tied to very unstable items like small sticks stuck in the dirt/mud or a sticker bush branch. I left them on all of the bigger trees and will clear them out next winter if they’re still there. I didn’t start picking up any of them until they had been up for a few months- and I probably only got 1/5th of them- the rest to be gotten as winter approaches later this year. Most caterpillars are “Good Guys”. But gypsy moth larvae and “Tent” caterpillars are not. I recommend getting rid of these pest caterpillars. Spraying with a solution (water) of Bacillus thuringiensis (B.t.) or of plain water from a hose are among the environmentally friendly methods to knock down undesirable caterpillars. B.t. is available in several varieties. Choose one that’s specific for gypsy moth larvae or other problem insects. Timing is critical. B.t. is NOT harmful to predatory insects, bees, earthworms, birds and other critters. I’m confused, how can you argue against Scotts when you also argue to leave your dog waste in the woods? Dog waste is nothing but concentrated fertilizer and bacteria, and in an urban area can be even more hazardous than putting chemicals on the lawn. You also argue for being a steward of the local environment and for the painful paperwork of organic certification, yet you don’t comment if the landowner knows that you’ve “unofficially” adopted their stream. Have you received their permission? And if you don’t know what a Virginia bluebell is, you’ve no right to be plucking “mustard” how do you know that you’ve only plucked mustard vs. Osmorhiza, a native plant also with small white flowers? Seriously disappointed in information here, makes me worried about MOMs commitment to the environment when it just seems like you do whatever suits you best, call it environmentally responsible and get kudos (from the other commenters) to be so. Don’t mean to be such a downer, but you work with some great organizations that can help you get your facts straight. Concerned- yes, you’ve figured us out. We’re a big fraud over here at MOM’s and all of our facts are wrong- all because I don’t think dog poo is an issue worth worrying about. Rather than make a slew of non-sequiturs and baseless assumptions- leading to some rather far-fetched conclusions (like how I can’t possibly know what invasive mustard plants are without being able to identify a Virginia bluebell?! ?- or how I can’t be a steward of the local environment without informing property owners I’m picking up trash on their property?!? ), how about sticking with the topic and respond specifically to the dog waste issue itself? btw- the creek where I pick up trash is a public park, not privately owned. If you want a conversation, go and read my last comment on the ‘highly controversial’ “Man Walks Dog, Terrorizes Neighborhood” blog post and rebut it- and take a look at “Sue’s” link from the EPA regarding the “long grass principle” and let me know why you think the points made are erroneous. Sorry for the non sequitors, I was using multiple examples from across your blog posts to demonstrate that you may not be as informed as you should be. I apologize to holding you to a higher standard due to your company’s committment to stewardship and environmental issues. You are not alone in any of the assumptions you’ve made on your blog. 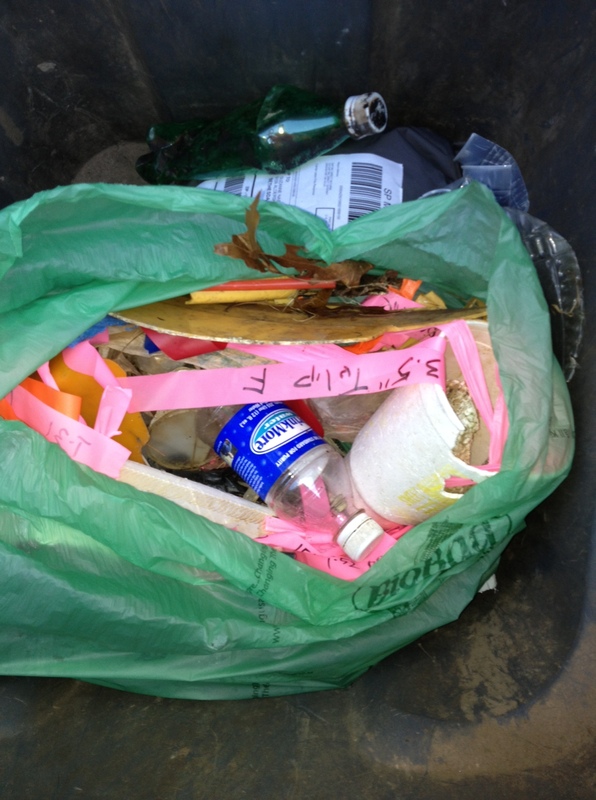 The most effective assurance that you will not be contributing to local non-point runoff is to pick up the waste. There are many good, compostable bags to do so, in fact, the bulk food bags your store provides makes excellent pooper scoopers, and there are many good composting options (but it isn’t recommended to use composted pet waste on edible gardens due to pathogens). Please explain why one, example of if you are going to not pick up your pet waste do, only allow your pets to go in areas of dense vegetation away from streams and waterways, trumps the numerous examples, over and over, telling you that pet waste is bad for urban watersheds? Perhaps that is why this is such a controversial topic – one person (you) can make a difference to the approximately 40% of dog owners that, at least occassionally, fail to pick up after their pet. To address the other issues, if you do not know the name of a very common native plant, a charismatic megaflora plant, perhaps you are not the best spokesperson to encourage people to pick “mustards” – as you may not know which mustard is the native and which the undesirable non-native (a much more estoeric distinction). Many desirable natives are mistakenly removed from local ecosystems through misidentification. Your blog sort of encourages people to go out and remove their own mustards. . .
Public land has landowners – the public. Likely your local park has an organization behind it whom you can talk to in order to obtain permission to be an official steward of the stream. This is much less painful than becoming certified organic, and does not cost any money. And, my final non-sequitor, all I really wanted to know was more about Mom’s Organic Coffee. Isn’t it about all the thousands of tiny papercuts the earth is receiving? We can only each do our own part. Isn’t that why we go the extra mile to go to your store, buy products that are created in a more sustainable way and will hopefully be better for oursevles? Concerned- I went through all of your links, just as I had read through all of the links in the original blog post on this topic- and I posted previously a response to this conventional “wisdom” that dog waste is a problem. In a nutshell, I don’t believe that dog waste is a problem. You and others can continue to provide link after link of people and organizations who believe it is a big problem, but all I see is a continual repeating that it’s a big problem, but no EVIDENCE. Take, for example, this tidbit that I got from one of your links… “EPA estimates that two or three days’ worth of droppings from a population of about 100 dogs would contribute enough bacteria to temporarily close a bay, and all watershed areas within 20 miles of it, to swimming and shell fishing.” Really!?!? That’s about 100lbs of dog waste- and THAT would close an entire bay and 20 miles of watershed? I simply don’t believe it, and don’t see any hard evidence. I suppose it could be theoretically possible, but what are the odds. “That study that you’ve linked [http://www.publicnewsservice.org/index.php?/content/article/31878-1] doesn’t make sense. The “cost per lb.” must be for removal of lawn fertilizers, rather than prevention. Prevention is much more cost effective. How could it possibly cost $1500 per lb. to eliminate fertilizers from private lawns?!? Saving the environment by forcing everyone to pick up their pet’s waste is like trying to curb global warming by eliminating fireworks on the 4th of July. First of all, picking up dog poop is bad for the environment is some ways. Those “tons” of dog poop need to be taken on trucks, which weight adds to carbon emissions. Not to mention, landfill space is taken up. And, I can’t tell you how many times I’ve picked up plastic bags of poo in the woods. Let’s first focus on human/animal waste alone. First of all, there are tons and tons of human waste going into our waterways from leaking/overflowing sewers. 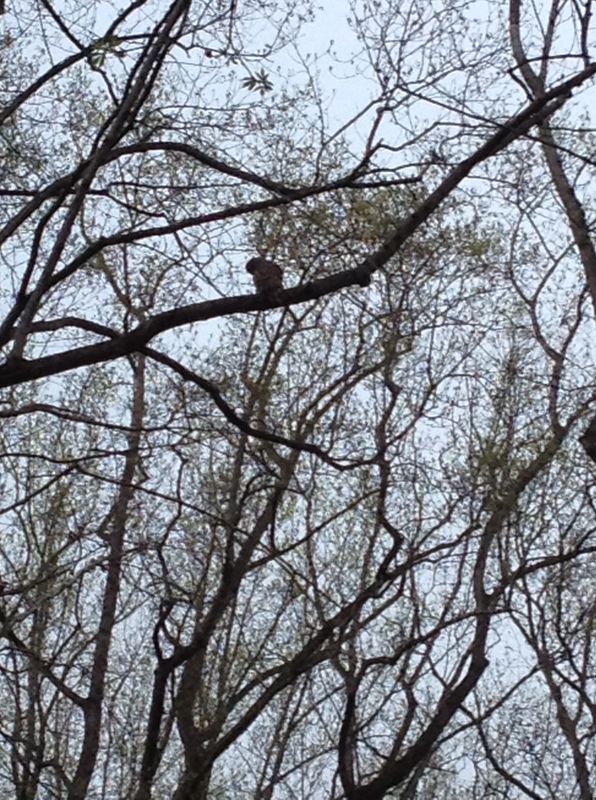 Then there are the wild animals, the squirrels, fox, raccoons, birds, opossums, rodents, and reptiles- and the deer! Estimates say there are about 200 deer per square mile in the suburbs of MD. And outdoor domestic cats. Next, the livestock. Chickens, pigs, cattle- you name it. Of all of that tons and tons of waste, how much is dog waste? Dunno, but I’ve gotta imagine it’s in the single digit % range. And the other factors that harm the bay? Let’s start with the fact that probably 90% of privately owned non-wooded acreage is sprayed with something (the unsprayed wooded acreage we already know is getting constantly pooped on by wild animals)- whether that be lawn companies spraying private lawns, landscaping companies spraying commercial properties, golf courses are near toxic, non-organic farmers, etc. How many millions of tons of chemicals does this add up to?!? Then there is the pollution from roads. Oil, ice/snow chemicals, windshield wiper fluid, plastic trash. And I wonder how much pollution comes from corporate manufacturing plants dumping their waste into rivers? So, of all of those factors, this study claims that the best and most cost effective way to save the Bay is to focus on dog poop? Many of these studies that say ecoli is a threat to swimmers. Well, I’m not all that concerned about swimmers. More concerned about the ecosystem of the Bay. How many people are REALLY getting sick from bacteria in our waterways? Does anyone know? 10,000? 10? The first article linked in the comments section, which IMO was the best- even that one, after much scientific analysis saying that dog poo does indeed add to the bacterial levels of waterways, uses an example of an extreme contamination case where it says that the dog poo adds as much as 10% of the bacterial contamination. 10%? In an extreme case? Of bacterial contamination, which is only a fraction of the problem (the major problem being the millions of tons of chemicals applied to farms and lawns everywhere)?